Eventually, Ilka Stuhec of Slovenia beat Vonn and took gold, defending her title from the 2017 worlds. Stuhec finished 0.23 seconds ahead of silver medallist Corinne Suter of Switzerland and 0.49 ahead of Vonn. Canada's Roni Remme finished 28th. Four U.S. flags were in the grandstand when Vonn came down and there were quite a few cheers when she started her run wearing a suit with blue-and-yellow trim — Sweden's colours — to honour Stenmark. "She has been my favourite skier since 2008 when I saw her winning on television," Bodin said. "I was a little girl sitting on the sofa. I just thought what a great skier and inspiration." 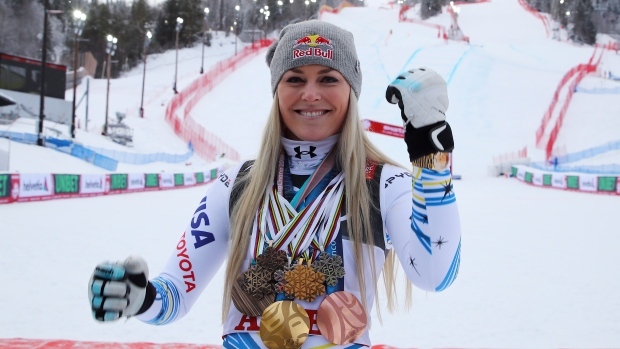 Fog and wind forced organizers to shorten the course to the second reserve start, which favoured Vonn because it reduced the strain on her knees.